The Greek word klema means a twig. 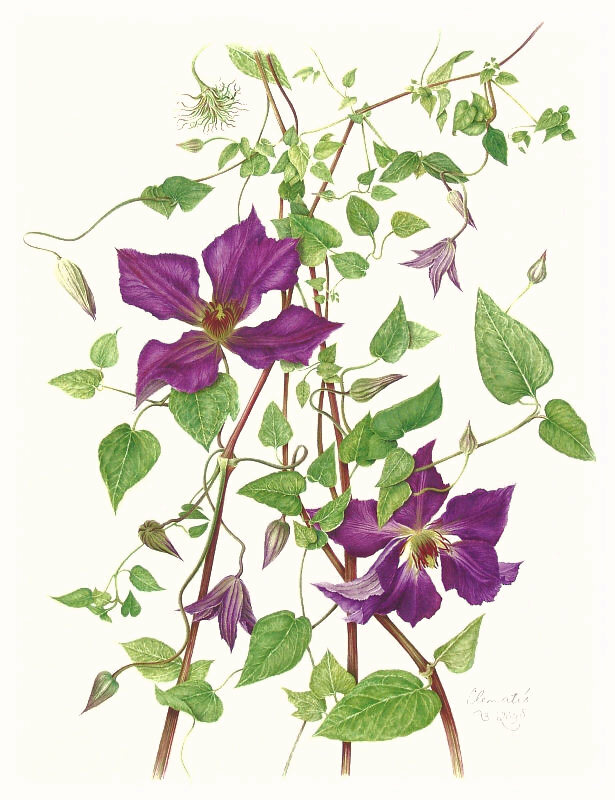 The Clematis derives its name from its resemblance to a branch of a vine—woody, winding, climbing. In the language of flowers Clematis represents mental beauty and ingenuity. Most larger-flowered varieties of Clematis originated in China and were imported via Japan by plant enthusiasts of the western hemisphere. Several hundred species of Clematis, widely distributed throughout the world and immensely popular with breeders have resulted in numerous and ever increasing varieties. One of the most familiar with its spectacular flowers is Clematis x jackmanii, a cross between three different varieties, bred in the nursery of George Jackman in 1858. Most British hybrids were exported to the U.S. in the 1890s. Clematis is also known as traveller’s joy, found along hedgerows and roadsides adorning the path of travellers, serving no other purpose except to provide pleasure and delight with its flowers. An older name, virgin’s bower, was given for Elizabeth I, the Virgin Queen, while some associate it with the Virgin Mary because of its white, mystical, feathery fruit. Oddly enough it is also suggests witches and the devil because it chokes other plants to death. It is easy to see how the silky white strands of the fruit structure earned the name old man’s beard, and to the Japanese, wire lotus. My neighbor’s trellis displayed an old established, twining, climbing, spreading Clematis studded with spectacular magenta-purple blossoms, a magnet compelling me to overcome all reserve, ring the doorbell and request a cutting. I was new to the neighborhood, knew nobody, but what an unconventional way to break the ice and get acqauinted!